Definition: The conductor is the type of metal which allows the electrical current to flow through it. The electrical conductor is generally made up of metals like copper, aluminium and their alloys. In an electrical conductor, the electrical charges moves from atom to atom when the potential difference is applied across them. The electrical conductors are used in the form of the wire. The choice of the conductor can be taken into account by considering the various factors like tensile strength, fatigue strength, corona loss, local conditions and cost. The electrical conductor which is used for power transmission is usually stranded. Stranded conductors have great flexibility and mechanical strength as compared to a single wire of the same cross-section area. In stranded conductor usually, the centre wire is surrounded by the successive layers of wires containing 6, 12,18, 24,… wires. The size of the conductor is determined by its equivalent copper cross section area and the number of strands with the diameter of each strand. The equivalence cross section of a stranded conductor is the area of a cross section of the solid conductor of the same material and length as the stranded conductor. And also the conductor having the same resistance at the same temperature. Hard-drawn copper, hard-drawn aluminium conductors and steel-cored aluminium conductors are most commonly used in a power. Some of the important types of conductors are explained below in details. Such type of conductors gives high tensile strength. It has high electrical conductivity, long life, and high scrap value. It is most suitable for distribution work where spans and tapping are more. The tensile strength of the copper is increased by approximately 50 percent by adding about 0.7 to 1.0 percent cadmium to it, but their conductivity is reduced by about 15 to 17 percent. The property of higher tensile strength enables the conductor to be erected on longer spans with the same sag. This conductor possesses the advantages of easy joining, more resistance to atmospheric condition, better resistance to wear, easy machinability, etc. The temperature at which copper anneals and softens is also increased, and temperature effects on stresses are less. The variation in sag due to changes in load and temperature is minimised. In steel cored copper conductor one or two layers of copper strands surround a steel cored copper conductors.The steel core adds the tensile strength to the conductor. In such type of conductors, the uniform layers of copper are welded onto a steel wire. The conductivity of the copper welded conductor varies from 30 to 60 percent to that a solid copper conductor with the same diameter. Such types of conductors may be used for longer span such as a river crossing. The cost of the copper conductor is very high, and hence it is replaced by the aluminium conductor. The handling, transportation and erection of the aluminium wires become very economical. It is used in distribution lines in the urban area and short transmission line with the lower voltages. All aluminium conductors are not sufficiently strong mechanically for the construction of long span lines. This deficiency in strength can be compensated by adding a steel core to the conductor. 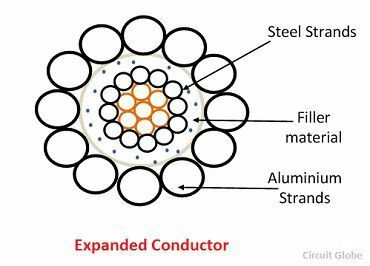 Such a conductor is called steel-cored aluminium conductor (SCA) or aluminium conductor steel reinforced (ACSR). 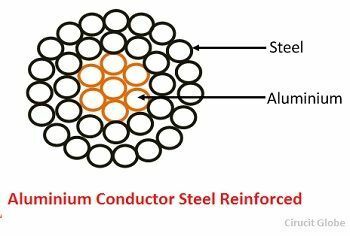 The ACSR conductor has seven steel strands forming a central core around which there are two layers of 30 aluminium strands. The conductor stranding is specified as a 30 Al/7 St.The ACSR conductors have high tensile strength and light weight and hence it is used for small sag. 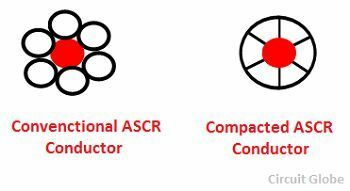 Such type of conductor is also called Compacted ACSR. The conventional ACSR conductor is pressed through dies to flatten the aluminium strands into segmental shape. The interstrand space is filled, and the diameter of the conductor reduces without affecting its electrical and mechanical properties. This conductor can be made with different ratios of aluminium to steel. The figure shows below the conductor having ratio 6 Al/1 St.
For reducing the corona loss and radio interference at a high voltage a fibrous or plastic material is filled between the strands. The diameter of the conductor expands due to the filling material and hence, it is called an expanded conductor. These conductors consist paper material which separates the inner aluminium strands from the outer steel strands. Such type of conductor is mostly used in urban areas. This conductor has a good combination of conductivity and tensile strength. One of the alloys which are used for making such conductor is Silmalec.This alloy contains 0.5% silicon, 0.5% magnesium and the remainder aluminium.These alloys are very costly as they are heat treated. Aluminium Conductor Alloy Reinforced has a central core of alloys of aluminium surrounded by the layers of conductor aluminium. Such conductor gives a better conductance with the strength-weight ratio equal to ACSR construction of the same diameter. Aluminium powder is welded onto a high strength steel wire. About 75% of the area of the conductor is covered by aluminium. This is more costly than core silicon conductor. It has been used an earth wire for making cores of SCA conductors. Phosphor bronze is used as a conductor material for very long spans such as river crossing. It is stronger than copper conductor but has got a low conductivity. This conductor is superior to the aluminium bronze conductor for atmospheres containing harmful gases such as ammonia. The galvanised steel conductor has high tensile strength. They are used in a very long span and in a rural area where the load is small. In such cases, the steel conductors may be replaced by a steel core conductor to deal with the extra future load. This conductor has a large resistance, inductance and voltage drop. But it has a small life as compared to other conductors. You have explained the concept of electrical conductor in a very nice manner. Keep up the good job. Thanks.